On the eastern edge of Oregon’s Coast Range sits the scenic Tualatin Valley, home to green pastures, amber hay fields and hillsides covered in orderly rows of award-winning wine grapes. The Tualatin Valley has long been a destination for those touring its many wineries, but today also offers adventure in its bike-touring opportunities. Cyclists are discovering a wealth of exciting riding possibilities — everything from long paved paths and inviting backroads to singletrack courses and challenging gravel routes winding their way through green forests dappled in sunlight. 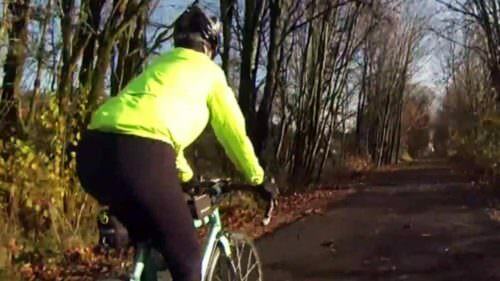 Of its many different riding options, perhaps the most popular is the Banks-Vernonia State Trail. 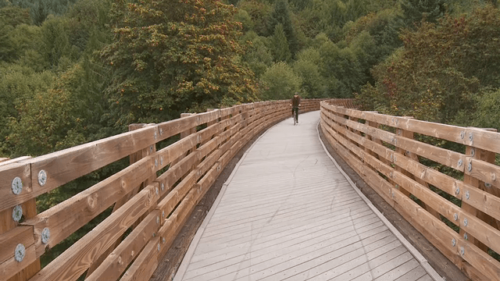 Part of an Oregon Scenic Bikeway, this paved path winds 21 miles along farms and through the forest as it connects the small towns of Banks to the south and welcoming Vernonia to the north. 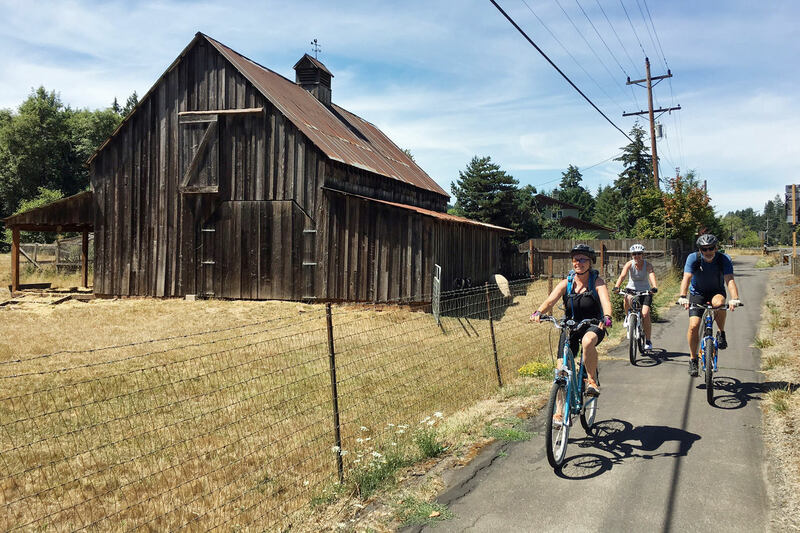 It’s the centerpiece of a 2- to 3-day cycling trip itinerary we’ve put together to showcase the charms of the Tualatin Valley, as well as Columbia County. The Banks-Vernonia Trail features scenic nature and historic landmarks, including wooden trestles that once carried railroad tracks. Begin your trip by “staging” in the town of Vernonia. Steeped in history tied to the forest industry, Vernonia will be your base for exploring the Banks-Vernonia Trail on day one and the Crown Zellerbach gravel ride on day two, before heading south to Forest Grove to explore two routes around scenic Henry Hagg Lake on day three. 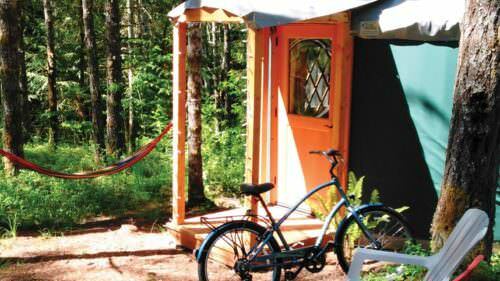 Reserve one night of lodging in Vernonia and one night in Forest Grove. Your first day of riding in the Tualatin Valley offers a choice of two out-and-back rides along the popular Banks-Vernonia Trail and Tualatin Valley Scenic Bikeway. Looking for some additional mileage? Arrive early in Vernonia and opt for the longer distance of 74 miles round-trip to Forest Grove and back. From Vernonia, take Jefferson Ave. south to Anderson Park, where you’ll find the Banks-Vernonia Trailhead leading west. Follow this paved rails-to-trails route with an easy 2 to 5 percent grade south for 21 miles. Give a silent thanks that railroad lines avoided steep hills — although there are a couple short, steep pitches where the trail drops down to the highway and then back up into the forest again. Along the way you’ll cruise over tall trestles, through sunlight-dappled corridors and along sweeping moss-lined curves, to the main trailhead in Banks. Here you’ll find public restrooms, water, Banks Bicycle Repair & Rental, a number of local restaurants, and a nearby gas station with a selection of snacks and chilled drinks. 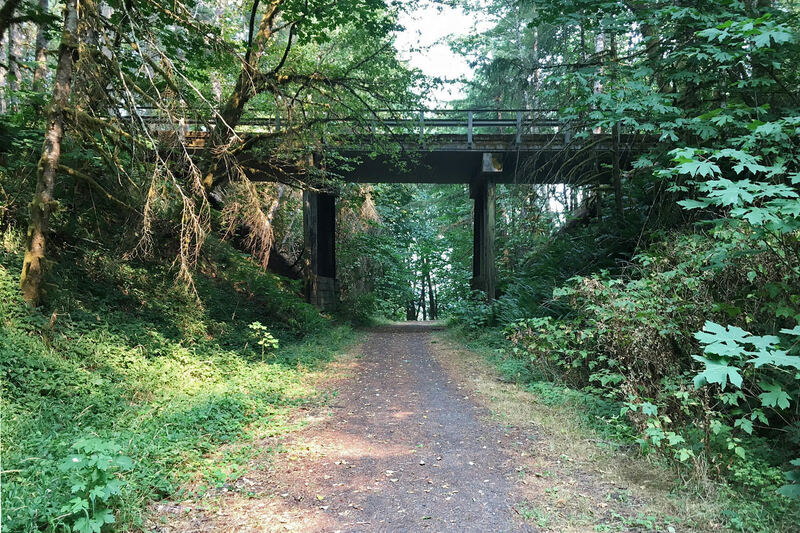 For those who want a bit more of an adventure plus some additional mileage, you can extend the Banks-Vernonia Trail from Banks to the town of Forest Grove. Upon arriving in Banks, proceed south on Hwy 47, which is the beginning of the southern portion of the Tualatin Valley Scenic Bikeway. Forest Grove is only 7 miles south of Banks as the crow flies, but your route today will meander through 17 miles and a dozen turns as it showcases the small farms and varied agriculture of the area. After you’ve rolled past hazelnut orchards, rows and rows of ripening raspberries, fields of tall corn and towering Oregon white oaks, you’ll arrive in Forest Grove, a quiet college town boasting a large selection of restaurants perfect for refueling for your ride back to Vernonia. For a detailed cue sheet for this portion of the ride, visit Oregon Parks & Recreation. 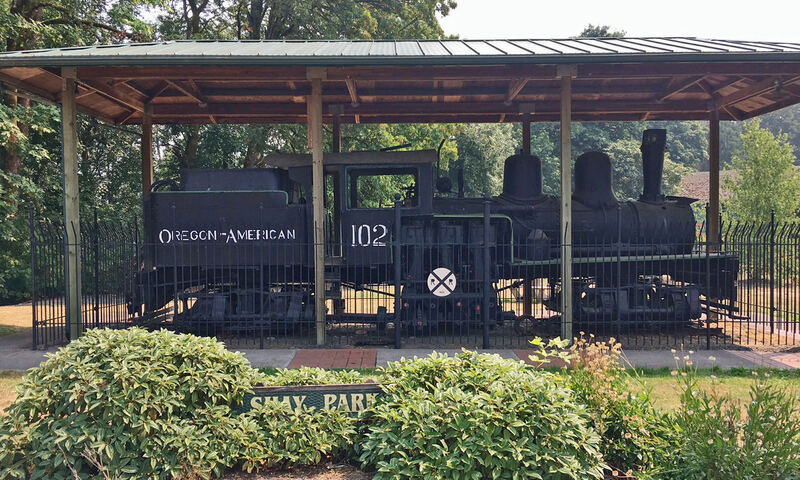 Now located in Shay Park in Vernonia, Shay locomotive #102 was once owned and operated by the Oregon-American Lumber Company. Located just off Hwy 47 in the heart of Vernonia, Shay Park houses Shay Locomotive #102. Built in 1912 and retired in 1953, this powerful locomotive was a workhorse throughout Oregon and Washington for 41 years as it hauled the trees and lumber that helped build the Northwest. Also found at the park is a small veterans memorial, a large piece of petrified wood and an old steam engine from the late 1800s, which was discovered in the nearby woods. The Banks-Vernonia Trail can be accessed at trailheads at Manning, Buxton, Tophill and Beaver Creek, as well as in the towns of Banks and Vernonia. The bike-friendly town of Vernonia offers cyclists many fine options for lodging and dining, making it the perfect hub for exploring a 42- to 74-mile round-trip ride of the Banks-Vernonia Trail/Tualatin Valley Scenic Bikeway, tackling some gravel on the Crown Zellerbach Trail, or spinning along one of the many forested roads in the area. The popular L.L. Stub Stewart State Park is located on the way to Vernonia along the Banks-Vernonia Trail in Buxton. It features 78 full hookup sites in two drive-in campgrounds (Dairy Creek Camp West and Dairy Creek Camp East), 12 walk-in sites at Dairy Creek Camp West, 23 primitive walk-in sites in the Brooke Creek Hike-In Camp, and three double-room cabins and 12 single-room cabins at the Mountain Dale Cabin Village. Crown Zellerbach Trail features fairly smooth riding on a converted rails-to-trails route. 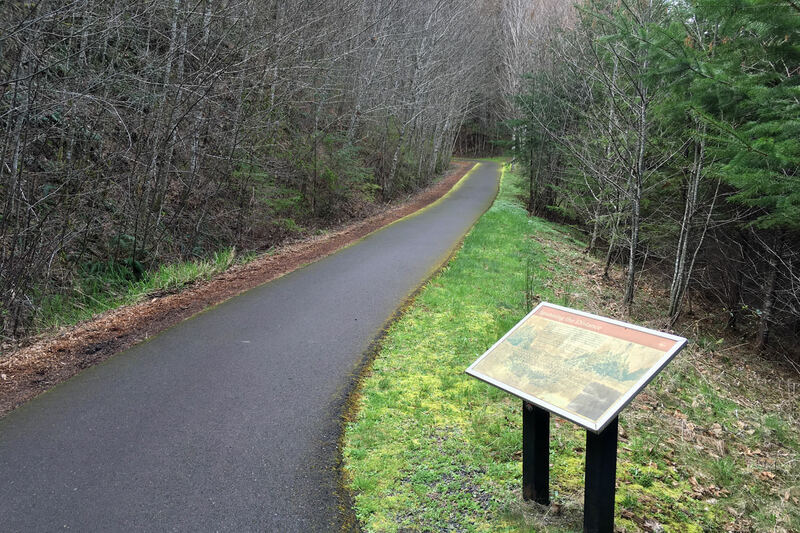 Stretching from the outskirts of Vernonia to Scappoose, the Crown Zellerbach Trail offers a bit of a different experience from the paved Banks-Vernonia Trail. A tad rough around the edges, this former logging road offers mountain-bike and gravel riders a nearly 22-mile out-and-back route over hard-packed and gravel doubletrack as it steadily but moderately climbs and descends its way through the forest. Though somewhat remote for much of its length, you won’t be alone, as alert riders will often be rewarded with a sighting of a large barred owl or two — the distinctive birds are often spotted here. And as you’re riding, it’s fun to imagine the fully loaded log trucks that once chugged along this road. The Crown Zellerbach Trail, or CZ Trail as it is often called, parallels the Scappoose-Vernonia Highway for much of its length. As a result, it touches or crosses the highway at a number of points, usually with an informal trailhead and small parking area. Here’s how to connect with the CZ Trail from nearby Scaponia Park. From Anderson Park in Vernonia, drive north on Hwy 47 for 5.1 miles to the signed turn onto the Scappoose-Vernonia Highway. Turn right here and travel south for 5.3 miles to Scaponia Park, on your right. Park here, pay the $5 parking fee, and then ride your bike south on the Scappoose-Vernonia Highway for approximately 0.2 miles to two adjacent trailheads on your left, with the second one being marked with a sign for the CZ Trail. (Note: The first trailhead is combined with Hawkins Road, which climbs a hill behind a large metal gate. Do not take this road.) Take the first trailhead, cross a small wooden bridge heading southeast, and gain the CZ Trail. 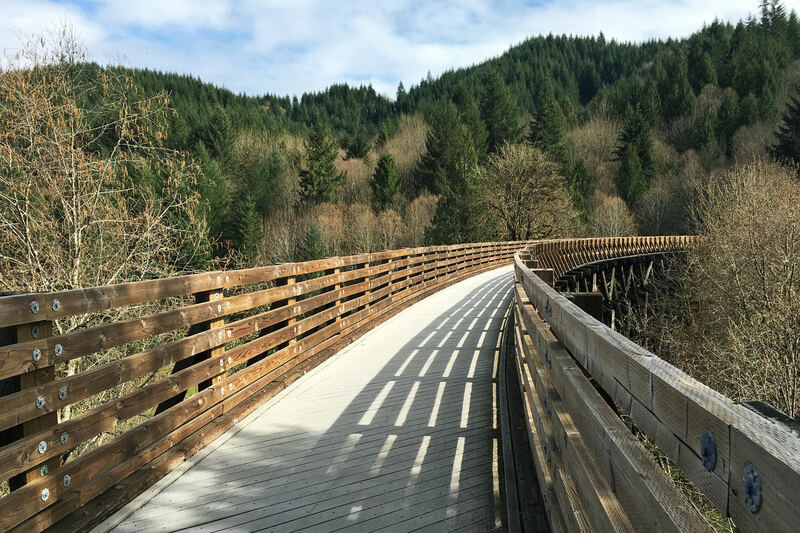 You’ll climb a steady, moderate grade for about 3 miles before crossing under the Scappoose-Vernonia Highway, at which point you’ll crest and begin a long 11-mile descent to Scappoose, where you can find food and drinks for your return ride. After you finish your ride today, you’ll be leaving Vernonia and driving south to Forest Grove for your second night’s stay. As a result, make arrangements to leave all your travel bags, belongings, cycling gear, etc. at your Vernonia lodging before your ride today, instead of leaving it all in your car at the CZ trailhead, and then pick it up after your ride and before continuing your trip to Forest Grove. Forest Grove offers numerous lodging choices to suit any budget, including McMenamins Grand Lodge, Best Western Hotels, Forest Grove Inn, America’s Best Value Inn & Suites and more. Making its way around scenic lake, the 13.6-mile Henry Hagg Lake Loop Trail is popular with beginner and expert mountain bikers alike. Its winding singletrack sends riders along banked curves, through a thousand feet of climbing, and down plenty of free-rolling downhills as it travels through a shady deciduous forest along the lake’s shoreline. You’ll touch on the lake’s edge multiple times, with a different viewing angle each time to offer perspective on this popular destination. Some argue that this trail is best ridden clockwise, while others will strongly disagree, saying counter-clockwise offers the most fun and variety. We’ll leave it up to you to decide. 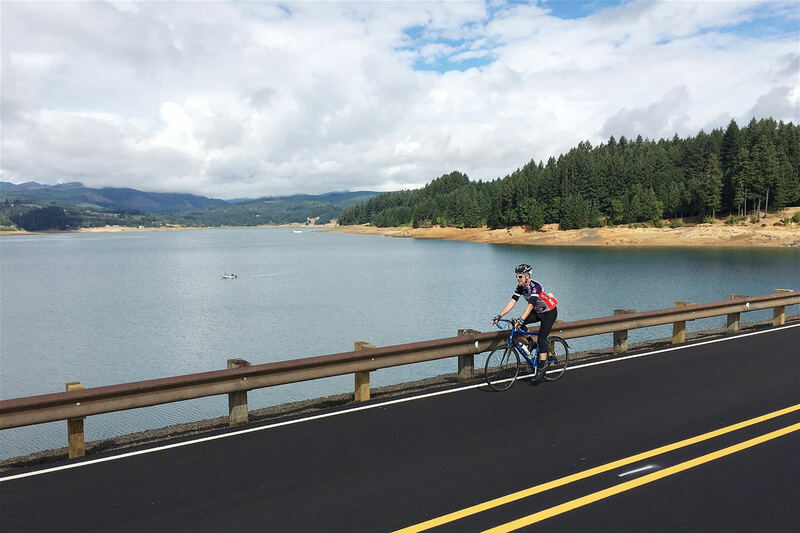 Cyclists choosing to road-ride around Henry Hagg Lake are rewarded with a 10.3-mile loop offering a wide shoulder, a little less than 780 feet of elevation gain, and a scenic view of the lake that’s always just off your shoulder. If you want to add some miles to make this more of a full excursion, begin your ride at McMenamin’s Grand Lodge in Forest Grove and make your way south toward Henry Hagg Lake on Maple Street to where it joins with SW Fern Hill Road. Follow this south to SW Spring Hill Road and turn right, continuing west to Old Highway 47, which then leads southwest to the lake. Make a loop of the lake and return to Forest Grove, and you’ll end up with about 30 miles for the day. Driving Directions: From Forest Grove, drive south on the Tualatin Valley Hwy/Hwy 47 for approximately 4.2 miles to SW Scoggins Valley Road. Turn west here and follow SW Scoggins Valley Road for a little over 4 miles to Henry Hagg County Park. Turn south/left onto SW Herr Road and park in the large parking area to your right. Mountain bikers can access the Henry Hagg Lake Loop Trail at the nearby boat ramp, located at the south end of SW Herr Road. Road cyclists can return back to SW Scoggins Valley Road, which joins with SW West Shore Drive to make a full circuit of the lake. Note: A daily parking or annual pass must be displayed in your vehicle at all times while in the park, and daily parking passes are sold year-round at the fee booth found at the park entrance, the park office and The Lake Stop store on the way to the lake (8015 SW Old Highway 47, Gaston). The park is open from sunrise to sunset, seven days a week. Overnight camping is not available. For information, call 503-846-8715 or 503-359-5732. Hours: Tuesday-Saturday, 10 a.m. – 6:30 p.m.; Sunday, 11 a.m. – 5:00 p.m.; closed on Mondays. Note that hours of operation can vary. Hours: Tuesday-Friday, 10 a.m. – 6:00 p.m.; Saturday, 10 a.m. – 5:00 p.m.